Live coding yielded a unique practice in computer music performance, where a musician uses a programming language as a musical instrument. 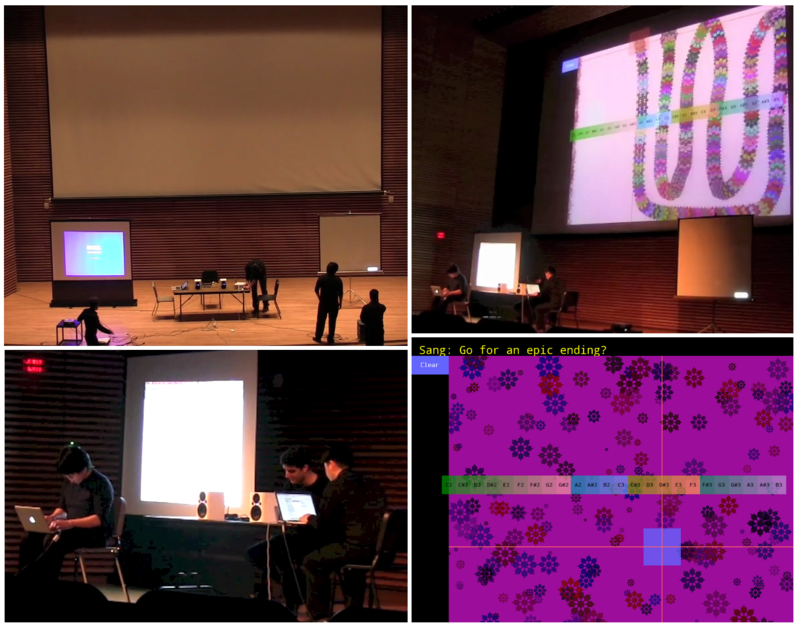 Typically, the outcome of live coding is generative music (and/or visuals). In contrast, we wish to expand the scope of live coding. Here the outcome of live coding is not music but a musical instrument implemented on a mobile device(iPad). There we have a seperate instrumental player who’s improvising with the instrument being made live. Using urMus, a development environment for mobile music interface, the coder can transfer source code to a device over a wireless network and remotely run the digital musical instrument without physical interference in performing. While the tradition of live coding offers to electronic musicians novel ways to be musically expressive with their laptops, there exist particular styles of music that are well presented with live coding; gradually evolving, constant tempoed, and repetitive rhythmic music. In contrast, it is hard to achieve immediate expressivity as you would with traditional musical instruments, where you produce one acoustic event with one gesture. Therein lies one of our motivations in this work: to decouple an instrument player from live coding to add fluid and immediate expressivity. In this performance, we have a instrumental performer who does not code but perform the instrument being coded over the network. 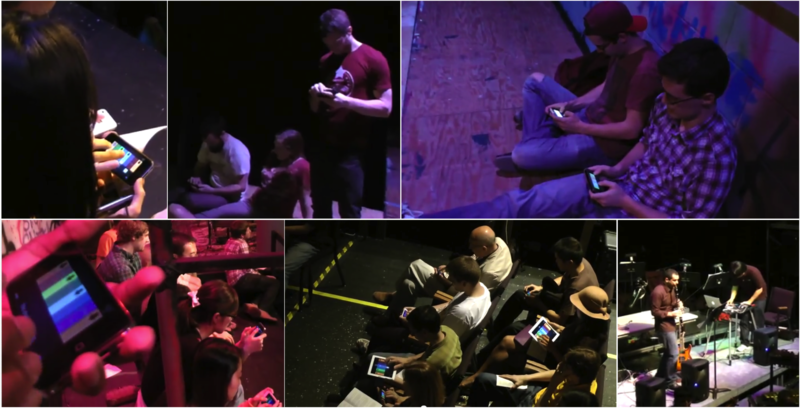 Two live coders implement a simple x-y controller on one tablet while a performer improvise with it. 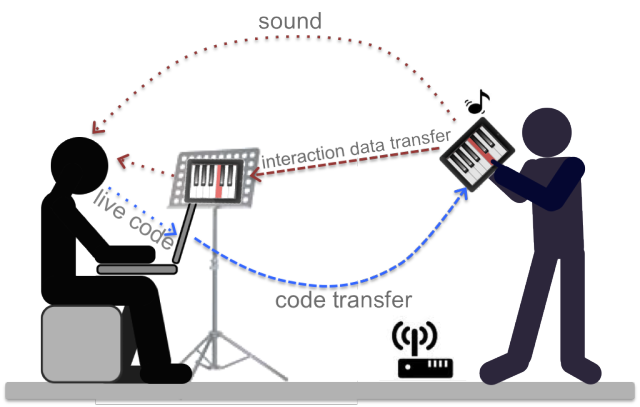 One live coder implements the interface (background, a movable button and mapping touch events to sound control parameters) while the other focuses on building the sound synthesis algorithm. Later in the video, a live coder, who deals with sound synthesis, can participate in performance by capturing(recording) a performer’s play and looping the pattern. The instrumental performance in the video is an improvisation but the idea of the mobile instrument live coded is shared and structured in advance. Live coding the mobile music instrument (paper). Live coding and Echobo paper got admitted to NIME 2013, South Korea. Unfortunately, I cannot go to present this papers but still Yay!